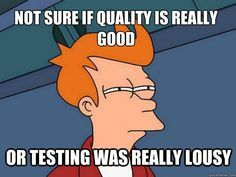 What is a QA tester? First off QA stands for quality assurance and if you are a QA tester you are testing the quality of any product to make sure it meets a certain standard of quality. There are several different types of QA testers in the world. Call centers, for example, will have a QA tester to periodically listen to customer service calls and see if the calls meet the company’s definition of quality. Another example would be in a manufacturing line. A QA tester would take random samples of a product being produced and determine if the quality is good. In a world where information is shared so rapidly people can go online, find the product they have purchased, and rate what they think of it. The point of a QA tester would be to find problems before the user does. You will not find every problem, but if you can mitigate major problems then when people review your product you will not have as much negative pr (public relations). Consumers will write something bad about a product far more then they will write a good review. While there are several types of QA testers in the world, the most common today is in the world of software engineering. If you talk about a quality assurance tester for testing software there are two main paths of testers. Quality Assurance Engineer – The qualifications for a QA engineer are the same for a software engineer. He or she has to know how to write code and test code. In a nutshell a QA engineer programs tests to validate software, works on frameworks to help a software developer test his or her code, and makes sure that the pipeline from creation to production of software has automated validation of the quality. This type of engineer can also be more focused on testing how the software behaves under stress or load conditions, or programmatically find vulnerabilities in the security of the software being developed. Quality Assurance Analyst – This job position does not necessarily require advanced knowledge of programming, but rather an in depth knowledge of how the product behaves and functions from a user’s perspective. An analyst is primarily focused on exploratory testing and seeing how a user would navigate his or her way through the product.